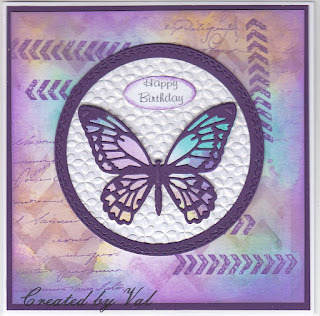 The butterfly challenge this time is all about chevrons and/or the colour purple and I started my card by making a background using Distress Oxide inks. After the white card was sufficiently coloured I used a chevron mask to lift off some of the colour - this was done by spritzing the mask with water and pressing it onto the background. Next I cut the square to fit a card blank, sponged the edges with purple and stamped some random text and chevrons. The back layer of the butterfly was die cut from some of the leftover coloured card and the top layer from purple which was also used for the frame which has zig-zag stitch detail (more chevron effect). The pearl card used for the white circle was embossed before sticking it all together and adding the butterfly. A small sentiment was added to this centre panel because I really wanted the background to be an important feature. There is inspiration for chevron/purple projects on the challenge blog - take a look and see if you can make something to be in with a chance of winning a butterfly themed prize. Love your idea of the chevron mask. It looks great as the background. I finally bought some oxide inks at the NEC but haven't even had a chance to take the cellophane off them yet!! Thankyou for fluttering into the garden. I'm loving those colours you have used. Hugs Mrs A. That is one very beautifully background you have created and it is the perfect backdrop for your lovely butterfly. In reply to your question .. .. "no" it is never too early for a mincepie and tot behind the bike shed. See you there!! LOL! !